In the aftermath of the clerical regime’s massive attack on the PMOI’s top headquarters in Tehran on February 8, 1982, young prisoners in Evin were taken to see the PMOI leaders slain on that day. The mullahs supposed that especially the young and inexperienced would be terrified but this was a bad miscalculation. They paid respect to the bodies and loudly chanted slogans against the regime in the prison yard. 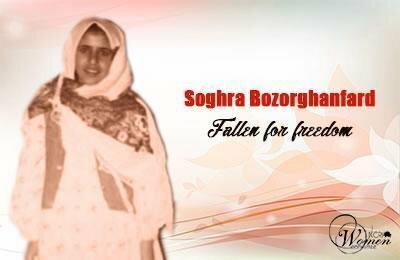 One such prisoner was Soghra Bozorghanfard. Soghra was born in October 1963 in Tehran to a lower middle-class family. She was only 14 when the Iranian Revolution took place but she participated in all the demonstrations along with her sister and brothers. She was a good student in high school and studied economy but had to quit school and go underground when her elder brother was sought by the regime for his support for the PMOI. She was arrested in December 1981 along with her mother (Arasteh Qolivand) and taken to the infamous 209th ward in Evin. Soghra was among dozens of prisoners in Evin who foiled the mullahs’ plot by crying out slogans against the regime and in support of the PMOI. Soghra was readily sent before the firing squad on February 8, 1982.